We value our passengers' time and know how inconvenient disruptions in San Francisco Bay Ferry service can be. Here's some information on the cause of service interruptions on our Vallejo ferry service since Thursday, January 17. The San Francisco Bay Area Water Emergency Transportation Authority (WETA) Board of Directors officially opened the new Ron Cowan Central Bay Maintenance and Operations Facility in Alameda on Thursday, December 13, 2018. 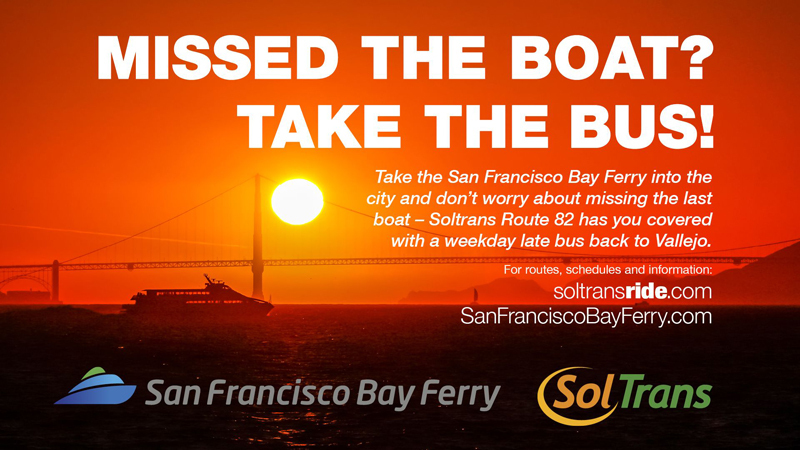 Vallejo ferry riders who miss the last boat or wish to remain in San Francisco late on weekdays have a great option to get back home that's now even more convenient. MV Cetus docked at the Richmond Ferry Terminal on January 10, 2019, the first day of San Francisco Bay Ferry service to Richmond.